From our apartments you can easily reach the most beautiful and famous beauties of Trapani’s province: Egadi islands, Segesta, San Vito Lo Capo, the salt-marks, etc. The ancient “Drepanon” offers to tourists a marvelous old town crowded with old buildings, walls, and observation towers. 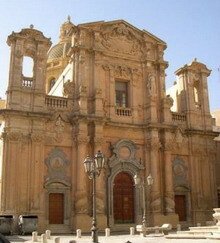 Famous all over the world for its coral and for the fishing of tunas, Trapani is today the Italian capital of sailing. According to Tucidide (Greek historian and writer), Erice was founded by the Trojan exiles who, escaping into the Mediterranean Sea, found here an ideal place for their settlement (giving birth to the Elymians). According to the Latin writer Virgilio, Aeneas touched twice the Erice soil: the first time for his father’s death, the second for games in his honor. But Aeneas is not the only Greek hero that wrote his name in the history of Erice: Hercules appears to have taken part in the greatness of the mountain, too. Together with Segesta (historian claim they were founded in the same period), Erice was the main Elymian city; in particular, it was here that religious rites were celebrated. During the first Punic war, the Carthaginian general Amilcare ordered its fortification. Then he moved part of the citizens for the foundation of Drepanum, the modern Trapani. 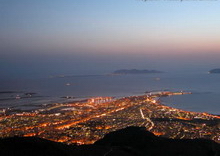 The Romans worshipped the “Erice Venus” that imitated the Greek goddess Aphrodite. Since 1963 it hosts the “Ettore Majorana” Scientific Research Center, dedicated to scientific studies and created by Dr. Antonino Zichichi. Placed in the northwestern part of Sicily, in the province of Trapani (in the municipality of Calatafimi-Segesta), Segesta is a town full of history. The unfinished hexastyle Doric temple (late 5th century BC) is built on a hilltop just outside the ancient city of Segesta. It is one of the best-preserved Greek temple. The theater is located on the top of a mountain and is partly dug in its rocks. The first who installed the basins for salt picking were the Phoenicians about 3000 years ago. Then came the windmills and the first half-industrial works. Now it is a magical place that offers amazing sunsets, among the most beautiful of the world. Run by the Italian WWF, the salt-marks include a territory of almost a thousand hectares. The nature reserve is divided into a Zone A, [the reserve area (707 ha)] and a Zone B of Pre-Reserve (278.75 ha), standing on the border between the municipalities of Trapani and Paceco. The salty environment, hosts several shrubs or herbaceous species which adapted themselves to the extreme environmental conditions of the place. The area is also relevant for ornithological studies, since it is located in the route of migration of many birds towards Africa. The first and biggest island of the archipelago is Favignana, which has almost a butterfly shape. The ancients used to call it “ Favonia”, because of the wind that always blows its costs. The island is a microcosm to discover, with the old “Tonnara Florio” plants, the isolated “Saint Caterina” fortress, and the Cathedral square, the vital center of the island, both for islanders and tourists. And how could we forget the old tuff quarries, its inlets (like the wonderful Cala Rossa and Cala Azzurra with their crystal clear waters). Just a bit far, here it is Levanzo, the smallest island of the archipelago (just 10 kmq), and the closest to the port of Trapani. Among the peculiarities are the little white houses grouped near the little harbor full of colored fishing boats. Levanzo is a strip of land which preserves some of the oldest vestiges of human presence in Sicily. The figures of men and animals painted and scratched on the walls of Genovese Cave, bring us back up to the Mesolithic, with its obscure rites, and its mysterious and wild life. Marettimo, the farthest and the rockiest of the three islands, is very silent and peaceful. Here you can spend your days in the sea or walking along the paths bordered by luxuriant vegetation. As well as Levanzo, Marettimo is the ideal place for diving lovers, thanks to the different kind of seabeds which surround the island, and the hundreds of caves present along the coast. Mothia was founded at the end of VII century B.C. on the island of San Pantaleo, located in the centre of a large lagoon, known today as 'Stagnone'. Thanks to its location, particularly favorable to maritime trade, Mothia soon became one of the most prosperous Western Phoenician colonies. The more outstanding public works date back to the second half of VI century B.C., namely the fortifications, a submerged road which was used to link the island to the mainland, near Birgi, the cothon (or drainage basin and harbor) and the main sanctuaries, in particular the tophet, where the burnt remains of offerings and sacrifices in honor of the god Baal Hammon were collected. Over one thousand carved steles where discovered here, undoubtedly the most significant evidence of Phoenician Punic sculpture. The ancient town’s industrial area features several omega-shaped furnaces, in every way similar to the more ancient pottery furnaces used in Phoenicia. Marsala occupies the site of Lilybaeum, the main stronghold of the Carthaginian in Sicily, founded by Himilco in 396 BC after the abandonment of Mothia. Neither Pyrrhus nor the Romans were able to reduce it by siege, but it was surrendered by the latter in 241 BC at the end of the First Punic War as a condition of the peace treaty. The modern town takes the shape of the Roman camp within the earlier city, one of the gates of which still existed in 1887. The main street (the Cassaro) perpetuates the name castrum. 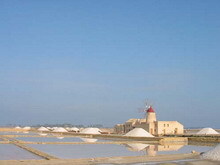 Now Marsala is the biggest agricultural, industrial, and trade center in Trapani province. 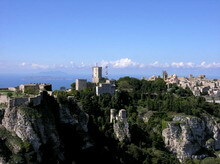 The municipality of San Vito Lo Capo was born in the late eighteenth century in the territory of Erice. 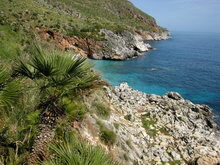 It is located at the bottom of Mount Monaco, in the bright bay between Capo San Vito and Punta Solanto. Several natural hollows still offer the chance to find a lot of traces of the Paleolithic, Mesolithic, and Neolithic age. Enveloped in the mystery is the existence of a old small village called Conturrana. It was a huge cliff which detached from the mountain and it is located 500 feet away from the shore. In this place probably, in the late fifth century, there was a little village. Nowadays the church is the centre of the town. 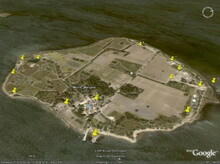 Once this Sanctuary had a defensive function against the corsairs. Up to 30 or 40 years ago only few fishermen houses could be seen, while now San Vito Lo Capo is a typical nice Mediterranean town. Zingaro reserve has an area of 1650 hectares, a coast line of about 7 Km, composed by a rocky coast of stones of the Mesozoic era, full of several little caves and characterized by a cliff of 913 meters (Speziale Mountain). Zingaro reserve enchants for its harsh beauty, for its intense colors in every season, for its white little caves set in a turquoise sea, for the omnipresent dwarf palms, the luxuriant Mediterranean scrub, the wild olive trees and the majestic carob trees. Even if the Zingaro is a terrestrial reserve, the sea is a relevant feature since it is part of the landscape and an essential complement of the nature. The coast side is an alternation of high rocky walls and little caves which sink in the blue sea. The little caves are all paved with cobbles and they look like clear niches hollowed in a side of the dolomite walls. The submarine landscape is full of colours and shapes. The tunnels and the submerged caves are several and interesting (like Colombaccio cave, located close to the east boundary with an entrance of about two meters, which reaches all the other caves like Craperia Cape, Craperia Cave, Mustia Cave, Ficarella Cave). Coopyright © 2010 - Residence La Lampara di Immobiliare S. Francesco di Salvatore Spitaleri & C. s.a.s.